It is all about letting go but also grabbing more at the same time, and then finding ‘it’. Technology has opened up the door to both scale and fragmentation and social business is the one pushing through this open door. We are increasingly facing the Collaborative Economy everywhere we turn. 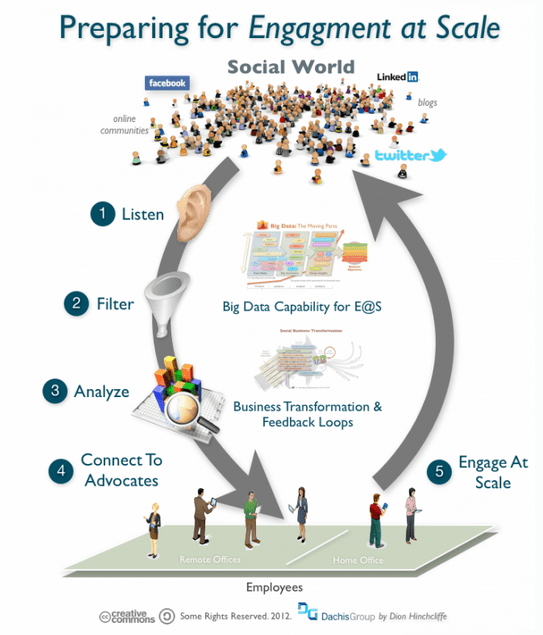 Social business is becoming the denominator of success or failure. New rules are emerging – you could say new theories – and where are these fitting within the corporate mindset? The shift of what our customer means to us, are we still competing with them, pushing them to accept a value proposition that forces them to begin to look elsewhere? Are we still determined to hang onto control, in the (mistaken) belief we know what is best for our customers? 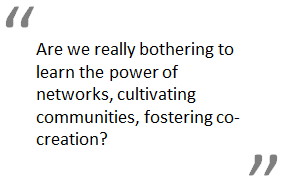 Are we really bothering to learn the power of networks, cultivating communities, fostering co-creation and optimizing shared-value, instead of just creating and selling things? Are our structures and processes still stuck in the past or are you transitioning to managing a more social business that operates in more dynamic ways? There are a huge number of new rules and ways to manage. It is the ones that master these that will succeed in diffusion and adoption at very different speeds than we can imagine today. The first post outlines the different theories and establish their value in our thinking. The second post, this one, relates these theories into their to achieve success in penetrations of our target markets and increase sales through growing adoption. The third and final post in this series looks at how Rogers’ theories relate to us in today’s connected world, and in particular with reference to Apple and finally offers up some of the reasons why diffusion can fail to occur. We are all in need of answering numerous questions and finding our way. It is relentlessly chipping away at the fabric of how organizations have been organized. In less than half a decade societal and cultural shifts through technology, the transfer to global open digital networks have taken us way beyond “just the internet” for connecting. We are in need to engage in totally different ways. It is really not good enough to sell just products and services anymore. These are basic value propositions. Customers are looking on how these are connected into different “bigger pictures”. The questions of your sustainability approaches, environmentalism, corporate social good and responsibility and a growing interest in governance are shifting their thinking. Your customers are wanting to connect and establish a different level of trust than simply those invested in a brand name, that is becoming table stakes or even irrelevant. We are moving into a very different territory. Grasping the changes to your business are highly challenging. Large organizations are being challenged by the sudden rise of self-organizing communities where people come together online and create shared value that often forms an immediate organization to challenge the existing. Traditional business models need to learn to adopt in different ways themselves. In an era of high-velocity online start-ups, where the next generation of digital businesses are taking up the space as they focus increasingly on the dynamics of social business where does this leave our existing organizations? There is an urgent need to “letting go and grabbing more”. Traditionally “we” provide products and services and many of our existing organizations are slowly coming to grips with providing on-line services. The belief is this is enough to satisfy customers, keep them buying and using the product or service. Is it? The social connected economy has reversed the relationship. Consumers just want to use and have provided product and services on ‘their’ demand and seek increasingly the platforms where they can easily go to find out and then use the required products and services. Often they don’t want to buy these, they just want to rent them to do the appropriate job. The whole movement of jobs-to-be-done, identifying customer needs is yet again a place of increased focus. The larger organization still struggles with this as it wants to fit this ‘seen’ need into their structure and system. They are spending growing time adapting while others are pivoting quickly to capture this fluidness in need. In many ways diffusion and adoption lies more in the organizations inabilities than the customers. Perhaps the theories of Rogers have reversed. It is the power of people and how organizations react and determine differences that will determine diffusion and adoption, as explained by Everett Rogers. 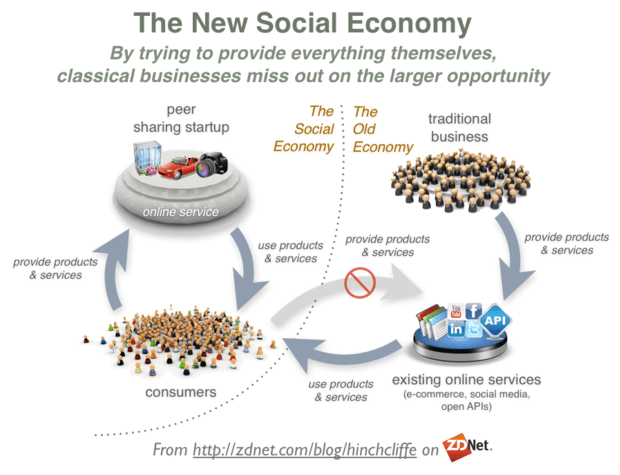 Dion Hinchcliffe, an expert on next-generation enterprises suggests an Engagement Fabric. Are we in a reverse situation for diffusion and adoption? Consumers race to diffuse and adopt, it seems our larger business organizations struggle. The organizations are the ‘laggards’. The organization as one does need to engage to any, not many. It is the ability to allow information to flow; we learn to aggregate stories or decipher trends to engage back to new groups of audiences that see your diffusion as valuable to their adoption. The organization continues to throw open its store. The ability to engage and promote self-organizing communities to exchange and extend around our product and services and keep them as engaged stakeholders who you work to keep involved in the evolution that triggers better innovations. Simultaneous engagement that is constantly synchronized with the evolving story, built more on business and social value, less on your product or service. Constant insights and thinking get captured for its ongoing community value and ability to keep improving on the product or service offered. Making the space highly visible and user-friendly. By ensuring ‘ease of access to knowledge you are allowing conversations to build and become increasingly valuable to all involved in the community. The ability to analyse, interpret and filter. Offer the place that captures the many good insights so as to set about the continued building of value into your products and services. “The future of the enterprise requires a mindset that doesn’t think in terms of fixed markets or point products or services. Instead, we must create, cultivate, and control fast-moving and highly competitive ecosystems of people, information, and value across a virtually unlimited number of channels. Diffusion and Adoption are even more of a business organization’s challenge to adapt to the most significant set of changes since the internet. It is the power of all the disruptive technologies, the power of social business and the incredible impact of all the connected networks are accelerating acceptance or rejection. Diffusion and Adoption is so far more complex but the principles of Rogers theories, offered nearly fifty years ago, can help to understand a single innovation perhaps. It is today the way you build your platform for engagement which will determine where you stand in any adoption race for the health of your business and its model in the future. It is the business organization that is in its race for adoption. 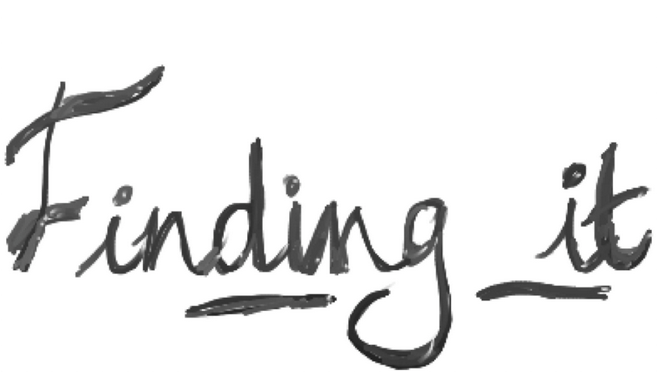 Publishing note: This blog post was originally written on behalf of Hype and with their permission I have republished it on my own site. I recommend you should visit the Hype blog site where they have a range of contributors writing about a wide ranging mix of ideas and thoughts around innovation, its well worth the visit.